Most antidepressants (AD) directly or indirectly enhance the serotonergic tone in the CNS. 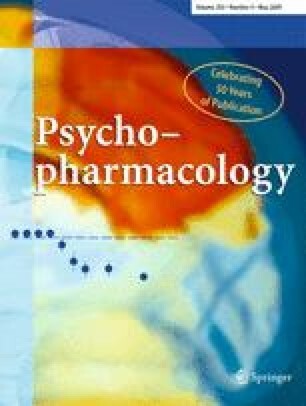 Since the serotonin system is involved in both, the modulation of mood and motor behavior, it was reasoned that these drugs might also interfere with running wheel activity (RWA), a form of positively motivated motor behavior, which might be linked to pathological states like obsessive–compulsive disorder (OCD). We used RWA to characterize ADs from all major classes. Effects on RWA were compared to effects on general locomotor activity (LOC) to control for unspecific effects on general locomotion. Two hours before lights-off, mice were treated with either vehicle or one of the following AD: the selective serotonin reuptake inhibitors (SSRIs) citalopram (3–10 mg/kg), paroxetine (1–10 mg/kg) and fluoxetine (2–6.6 mg/kg), the selective norepinephrine reuptake inhibitor (SNRI) reboxetine (1–10 mg/kg), the monoamine oxidase (MAO) inhibitors tranylcypromine (1–3 mg/kg) and moclobemide (3–10 mg/kg), and the tricyclic ADs desipramine and imipramine (10–30 mg/kg, each). LOC and RWA were measured after lights-off. At the highest dose tested, all ADs, with the exception of the MAO inhibitors, significantly reduced RWA. Both tricyclics inhibited RWA only at doses that similarly affected LOC. In contrast, all SSRI and reboxetine inhibited RWA at doses that left LOC unaffected. SSRI and the SNRI reboxetine inhibit RWA at doses not suppressing LOC. RWA may represent a simple behavioral readout of positively motivated behavior that merits further attention for psychopharmacology. The authors thank Helga Buschbacher and Andrea Egly for help with the experiments, Ulrich Benz, Werner Gabel, and Martin Heinrich for technical support and Anton Bespalov and Marcel van Gaalen for helpful discussion.